Miami has basked in the sunlight and spotlight for decades. First it started with the Art Deco district. Then the MiMo district, home to the Fountainbleau Hotel and other 1950's Miami Modern (MiMo) architecture, stole the spotlight. Today the MiMo is in a revel revival. 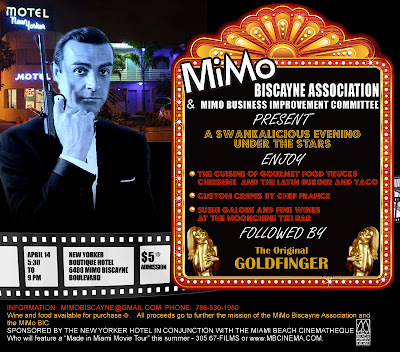 Here's an opportunity to relive that past with a screening of the James Bond movie, Goldfinger, at the beautifully restored New Yorker Motel (Normal Giller, 1953) at 6500 Biscayne Boulevard. Instead of filling up on the run-of-the-mill movie theater popcorn and hot dogs, savor on custom crepes, a wine bar, and a naked sushi station. Admission is $5.00 plus the cost of food and wine. All proceeds further the mission of the MiMo Biscayne Association and the MiMo BIC.